Japanese high-end audiophile manufacturer Almarro has announced their new koro-500A system. Their new new system includes the A50125A ($2,850) stereo integrated amplifier and a pair of M50A large floorstanding loudspeakers ($3,900). 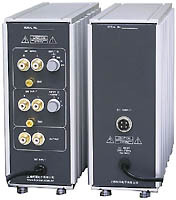 The A50125A employs eight 6550 output tubes, and a pair each of the 12AT7 and 5687 triodes. Operating in push-pull configuration the A50135A produce 125 watts per channel is stereo, or 250 watts in monoblock configuration. Frequency response is rated from 15Hz to 120kHz. The M50A floorstanding loudspeaker handles 300 watts and produces frequencies from 27Hz to 23kHz. The Eminence Delta Lite 2510 woofer is mated with a Dyton Pt2 planar tweeter and a pair of 4-inch midbass drivers. The Consumer Electronics Show (CES) has release attendee numbers. With an outstanding 1.38 million net square feet of show space, over 129,000 industry professionals, 2,400 exhibiting companies, and 18,000 international travelers from 110 countries attended the show. This compared favorably to their 2003 figures that were 118,000 industry professionals, over 2,200 companies, and 16,600 international attendees. Naturally Enjoy the Music.com provided virtually live show coverage, yet we have also just released three new show reports! Please click here to see all our show coverage to date. Quite a bit going on in the music world as Macrovision has released a more relaxed version of CD protection scheme, Napster developer Shawn Fanning works on a pay for play peer-to-peer software called Snocap, meanwhile the Recording Industry Association of America (RIAA) targets vinyl. Macrovision's latest generation of copy-protected music on CDs, called CDS-300, now allows content owners (i.e. record labels, music artists) to set "usage rules" on the Microsoft Windows Media files. This, in turn, will dictate how many times and to where a copy of the music can be made. Adam Sexton, Macrovision's vice president of marketing, said "Before, you had the 'second session' that was bolted to the disc. We're pleased we can now deliver the same functions and can go 'mano a mano' with the online services." Previous versions of their software blocked the ability to burn copies onto CD-R. This new move is in tune with Apple Computer's iTunes and Napster that also allow for CD-R copies of purchased music. companies agreeing to participate. If they do participate, it could be phenomenal." Not one to ever rest on their laurels, the RIAA settled with a vinyl pressing plant to the tune of $200,000 for alleged unauthorized pressing of vinyl. Pressing plant United Record Pressing LLC was accused of making unauthorized vinyl copies of music. Cary Sherman, President of the RIAA, said "We are pleased to have reached a settlement with United Record Pressing. This settlement should serve as a clear notice that the music community is serious about piracy in all music formats and in all types of media. Vinyl manufacturers, no less than other entities such as CD plants or online sites, must take steps to ensure that the proper licenses have been obtained for all their customers' products." The RIAA claims that 35 illegal stampers, a main part employed to press vinyl, contained over 170 unauthorized sings from musical artists including Mary J. Blige, Earth, Wind & Fire, Ricky Martin, and Barry White. A new computer virus, called "mydoom" or "W32.Novarg.A@mm", is spreading at an alarming rate via e-mail attachment. 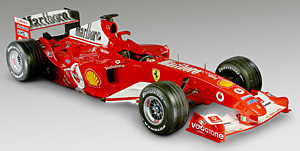 Please see: www.mcafee.com or www.symantec.com. According to Symantec this "is a mass-mailing worm that arrives as an attachment with the file extension .bat, .cmd, .exe, .pif, .scr, or .zip. When a computer is infected, the worm will set up a backdoor into the system by opening TCP ports 3127 thru 3198. This can potentially allow an attacker to connect to the computer and use it as a proxy to gain access to its network resources. In addition, the backdoor has the ability to download and execute arbitrary files." While we here at Enjoy the Music.com� have not been infected with this virus, it can spoof/forge an outgoing e-mail address to hide where said e-mail actually originated. Wheels (front and rear) 13"
As reported within the Enjoy the Music.com Industry News page on September 26, 2003, "Sharman Networks Ltd., known for their KaZaA peer to peer (P2P) file-sharing software, has filed a federal lawsuit directly accusing various entertainment companies of employing illegal versions of software in hopes of discovering KaZaA users' identity... Sharman Networks has claimed that various companies have been using unauthorized versions of their software to thwart piracy, which is in direct violation of the terms for using their network... Naturally there is concern from Sharman Networks Ltd. as they do not want those who use their software to face legal charges filed by the Recording Industry Association of America (RIAA)." Now a U.S. federal court agrees and Kazaa may sue the entertainment industry for copyright infringement. These lawsuits could include various recording studios (both audio and video). While various recording studios/companies petitioned U.S. District Judge Stephen Wilson in Los Angeles to throw out the Sharman Networks lawsuit, the Judge declined to do so. Naturally the RIAA has commented on this situation by saying "The court does not appear to want these claims to proceed at this point. If they ever proceed, Sharman will have a very difficult time providing evidence to support their allegations." While loudspeaker manufacturer Platinum Audio loudspeaker received critical acclaim and sold many products, they are not no longer in business. Those customers who had purchased Platinum Audio loudspeakers and now have had driver failures can find replacements from their head designer Phil Jones who said "I am happy to say that I have built a few replacement drivers for anyone out there who has had problems with Platinum speakers. I can be contacted at phil@philjonesbass.com and would be happy to help them." The new Simaudio Ltd. MOON Limited Edition Series of only 250 each that consist of five separate components that make up two unique music systems. The first system, referred to as the MOON Limited Edition Balanced Differential System is comprised of the MOON Eclipse LE CD player (pictured here), MOON P-5 LE Dual-Mono Preamplifier and MOON W-5 LE Dual-Mono Power Amplifier. The second system, the MOON Limited Edition Reference Music System is made up of the MOON Nova LE CD Player and MOON i-5 LE Integrated Amplifier. With their new Limited Edition Series, Simaudio has been more about evolving their highly rated products than starting from a new sheet of paper. Unique features include polished chrome accents, a 0.5-inch thick brushed and anodized silver faceplate, a custom 2 meter Cardas power cord and a Limited Edition serial number plaque. The MOON Eclipse LE CD player features four 24-bit DACs with an 8X oversampling digital filter in a fully balanced differential circuit. The result is an internal upsampling rate which achieves a 24-bit/352.8kHz level of resolution. On the other end of the spectrum, their The MOON i-5 LE dual-mono stereo integrated amplifier produces 75 watts per channel into 8 ohms (125 watt into 4 ohms), offers five inputs, tape loop, and pre-amplifier output. Moving forward with their plan to bring justice to those illegally sharing copyrighted music, yesterday the Recording Industry Association of America (RIAA) filed copyright infringement lawsuits against 532 individual computer users for allegedly illegal distribution of copyrighted music on peer-to-peer networks. Employing the "John Doe" process, the 532 suits sue defendants whose names aren't known, yet their numerical Internet Protocol (IP) computer address is. "Our campaign against illegal file sharers is not missing a beat," said Cary Sherman, President, RIAA. "The message to illegal file sharers should be as clear as ever - we can and will continue to bring lawsuits on a regular basis against those who illegally distribute copyrighted music." DH Labs Inc. has introduces three new Revelation XLR interconnect ($350 for 1 meter), HC Alloy locking banana plug ($15 each), plus their SP-10 and SP-14 angled step spades ($1.10 each). The Revelation XLR interconnect claims to "provide a wider soundstage, increased dynamics and a quieter background." 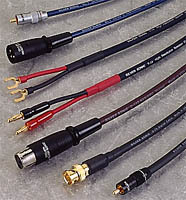 This is a balanced (XLR) version of the RCA cable as reviewed by Enjoy the Music.com� in September 2003's Review Magazine. DH Labs HC Alloy locking banana plug feature high copper content with a connector that locks to ensures the connection will not come loose. Lastly, their SP-10 and SP-14 angled step spades is said to solve the problem of various sized loudspeaker binding posts. With "one size fits all" SP-10 and SP-14, the spades are wider at the mouth, but taper inward to accommodate wide and standard binding posts. The barrel of the spades are also angled at 30-degrees for easy connection to an amplifier or receiver. The main difference between the two are in the gauge of wire they can be terminated to. Specifically, 10-12 AWG for the SP-10 and 14-16 AWG for the SP-14. 475 President Kennedy 475 Sherbrooke W.
Chris Sommovigo (Stereovox) and Stuart Marcus (Vampire Wire) have announced a joint project that will produce reference-quality precision-machined connectors for the audio and video industries. The project will be operating under the corporate moniker "Xhadow" (pronounced "shadow"). They have released the first product of this line. Specifically, an audiophile-quality XLR plug. 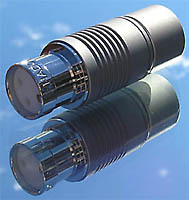 The XLR was slated as the first product to release because of the perceived limited availability of audiophile quality XLR connectors. The Xhadow XLR features machined contacts of pure copper that have been plated in silver, pure Teflon dielectrics, machined and anodized aluminum cases, and mirror-polished engraved "gender-modules" that mate to an aluminum back-shell. Terminations can be made via set-screw, solder, or both depending on the desire of the end-user. In the works are new loudspeaker binding posts, RCA plugs, RCA chassis-mount jacks, XLR chassis-mount jacks, bananas, and spades. Korsun's new MM/MC phono stage offers separate inputs for MM and MC while an outboard power supply is used to avoid interfering with the critical analog stage. The MC stage offers various resistance settings (47, 220, 1k, and 47k ohms) while the MM stage's capacitance is also adjustable (1,2,3, and 4 x100pf). The RIAA equalization section is accurate to within +-0.5dB from 20Hz to 20kHz while the overall frequency response is from 10Hz to 40KHz (-3dB). Overall signal to noise ratio is 96dB for MM and 81dB for MC stage with a total harmonic distortion of less than 0.008% (1kHz at 1V). Dimensions for the power supply and phono stage chassis are 86 �208 �270 (WxHxD in mm). Gold plated single ended (RCA) inputs and separate grounding for each stage is also provided. 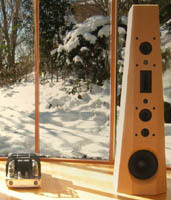 Buggtussel, LLC has introduced their new Acephalic line of loudspeakers. Their chief engineer, Dr. Kevin Blair, began producing custom loudspeaker systems in 1979. In 1985 Buggtussel initiated its foray into instrumentation development, leading to, among many things, a transducer utilized in the ground breaking POSDAM (POSition Dependent Amplitude Modulation) analysis of driver dynamic linearity and symmetry. Through the judicious application of modern electro-acoustical filter theory to the real life mechanics of driver, cabinet, and labyrinth reactance, the theoretical advantages of transmission line loading are realized in q-TSAL (quasi-Thiele/Small Actuated Labyrinth) without the unpredictable sonic limitations of primitive 1/4l based designs. Their new Acephalic line consists of their Circa monitor ($450 per pair), Mirac floorstander ($700 per pair) and top-of-the-range Sumo floorstander ($1,000 per pair). With frequency responses down to 45Hz, 35Hz and 25Hz (respectively), each unit reproduces sound up to 20kHz. All three models employ a 0.75-inch tweeter, though the Circa includes a single 5.5 driver, the Mirac has a pair of 6.5-inch drivers. The top line Sumo, pictured here, adds to this a pair of 8-inch woofers and has a sensitivity of 91dB/W/m. PayPal, an online payment service that has been mired with controversy due to their payment system, is now offering a micro-payment system for high volume online digital music companies. While doubtful any mainstream company would use them due to PayPal's added fees, these new fees are at a rate of 2.5% plus $0.09 for each transaction. Virtually all current online music providers have chosen their own payment system to better maximize their bottom line versus having to deal with PayPal and their controversial uninsured banking system. Linn's new Unidisk SC employs their Silver Disc Engine that identifies source material and outputs signals in their native format. This mean that CD, SACD, DVD-Video and DVD-Audio are handled independently and optimized with the precise decoding solution for which they were designed. The Unidisk SC also has digital inputs to decode external source components - both stereo and surround sound - while both fixed and variable analog audio outputs allow the Unidisk SC to be directly connected to amplification without the need of a pre-amplifier. The Unidisk SC player incorporates a comprehensive range of video outputs including progressive scan, component, S-Video and composite. Longstanding audiophile music label Mobile Fidelity Sound Lab (MFSL) is now offering their new ULTRADISC CD-R. MFSL's engineering team started experimenting with CD-Rs in the lab and found that many were melting incorrectly and 1s were being read as 0s and vice-versa. Pinholes within the CD-R would cause a decoder into high error correction mode, thereby "making up" data in the error correction circuitry. 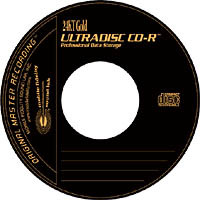 After researching and various prototypes, MFSL now offers their 24 Karat Gold ULTRADISC CD-R. It is said to be "designed for professional, data critical, music and graphic archival use, and all other data storage applications where there is no room for error or loss. These specially-gold-plated CD-Rs ensure excellent reflectivity, no corrosion, and dramatically improved resistance to light and heat. Additional features include instantaneous pit burning (burst burning) for superior pit formation and extremely low to no error rate; and a patented, specialized, scratch resistant, protective surface. In addition, the ULTRADISC CD-R undergoes an unprecedented four levels of quality control. Plus, MFSL offers a lifetime warranty for each CD-R. The average CD-R has a projected lifespan of 20 years � if stored in ideal conditions. But, accelerated aging tests show that the 24KT Gold ULTRADISC CD-R retains its specifications for more than 300 years." A 50-pack of raw CD-Rs is tentatively priced at $99.98 while a 10-pack with MFSL's trademark, deluxe, lift-lock case is tentatively priced at $29.98. It appears Mark Levinson of Red Rose Music, with ventures such as Cello Music that went out of business leaving no warranty for their customers, then started a new venture called Red Rose Music is now facing hard times. The below appeared on the door of the Red Rose Music room at the recent Consumer Electronics Show (CES). LAS VEGAS - January 8, 2004 - Engineer Victor Tiscareno and marketing executive Byron Collett have announced their departure from Red Rose Music, effective January 1. Declining to renew their employment contracts, the longtime business partners I have decided to pursue other interests in a technology company as yet unnamed. Mark Levinson remains CEO of Red Rose. The departure was an "amicable agreement" by all parties, Tiscareno noted. "We wish Mark continued success with Red Rose," he stated, "Byron and I simply felt that we had compelling interests elsewhere." The founders of the acclaimed Audioprism brand, Tiscareno and Collett plan to introduce a full line of two-channel and multi-channel amplifiers, pre-amplifiers, loudspeakers, and multimedia products over the coming year, under the umbrella of the San Juan Group, an investment consortium named for Puget Sound's San Juan Islands. "We will also provide sales and support of legacy products," Tiscareno added. He and Collett are demonstrating prototype loudspeakers at CES. The partners have yet to decide on a name for their new company. CES attendees who wish to help them choose a name can win a pair of loudspeakers (or the product of their choice) by writing their suggestions on the back of their business cards and dropping them in the bowl in Tiscareno's and Collett's room. Finalists must pass legal research for prior ownership of the name. The winner will be notified by email. Enjoy the Music.com offers virtually live show reporting of both the Consumer Electronic Show (CES) and also The Home Entertainment Show (T.H.E. Show). With over 67 shows reported online, Enjoy the Music.com� has long been considered an authority in offering live show reports on a daily basis during the event. The January edition of Enjoy the Music.com's Superior Audio magazine is now online. Equipment reviews include the Krell KAV-400xi integrated amplifier and VTL's TL-7.5 Reference line pre-amplifier. In the VTL review, Wayne Donnelly proclaims "Every audiophile knows the old saw that the perfect pre-amplifier would be �a straight wire with gain.� But the more I listen to every kind of music through the 7.5, the more it seems to me like "no wire with gain." This extraordinary component imposes less sound of its own on music than anything else I have heard." Click here to see the January edition of the Enjoy the Music.com� Review Magazine.